This guidebook includes 30 walks on the Jurassic Coast of Devon and Dorset. 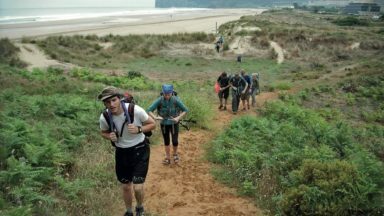 Covering the coast between Exmouth and Bournemouth, these delightful routes range from 3 to 16 miles (5 to 24km), exploring and explaining the spectacular geology of this World Heritage area with clear, easily understood descriptions, cross-sections and timelines. Year-round. Late July and August can be busy on beaches and car parks. Winter (October to March) has more challenging weather and can be muddy underfoot. Most walks are on good, clear paths. Coast path ascents and descents can be steep but are short. The longer walks, up to 28km, require physical fitness but many shorter ones allow time for studying the rockforms and fossils. Nearly 100 miles of clifftops. Fossil-hunting at Lyme Regis. 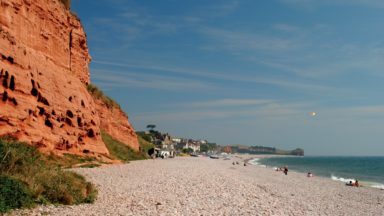 The quartzite pebbles of Budleigh Salterton. Tree trunks of 150 million years ago at Lulworth Cove. The Cretaceous sea that carved right across England. Chalk downland and a rude man at Cerne Abbas. The Purbeck crumple zone caused by Italy's impact with Europe. The Jurassic Coast of Devon and Dorset, stretching between Exeter and Bournemouth, is a geological wonderland. Natural wonders like Chesil Beach, Durdle Door and fossils so numerous you'll be tripping over them, combine with southern England's rolling Downs, tiny villages, beaches and sunny summers to provide a stunning and awe-inspiring landscape to explore. 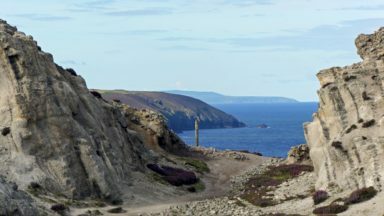 The 30 walks in this guide let walkers discover the best and most spectacular areas on the coast. 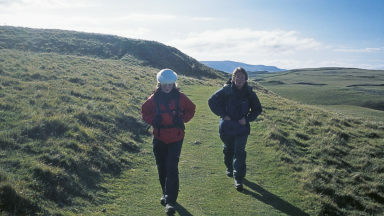 The walks are between 5 and 25km (3 to 16 miles) and provide a range suitable for all abilities. The guide has been divided into areas: Devon's Red Beds, the Lias, Chesil Beach, Chalk walks (Lulworth and inland) and the Isle of Purbeck. The geological descriptions are accompanied by strata diagrams, geological timelines, explanations of the creation of the various sedimentary rocks along the coast, and discussion of how and why the various formations formed millennia ago. The incredible - yet readable - detail brings these walks and the landscape alive. And yet, the routes can just as easily be walked for their own sake and the pleasure of rolling downs, high cliffs and beach sunshine. As well as detailed descriptions for every walk, accompanied by OS maps, there are details on available parking, points of interest along the way (on rocks and other sights) and advice on the terrain covered. 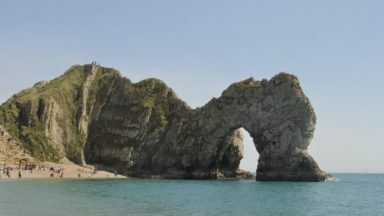 The general and geological introductions provide background on the region and the appendices give thorough information on local museums and information centres, cliff diagrams, a glossary of geological terms and a quick, look-up guide to the rocks of the Jurassic Coast. More than just a walking guidebook, this book is an invitation to explore and learn about this spectacular Natural World Heritage area. The route has reopened (Spring 2016) after being closed due to a landslip above Culverhole Point. The new, slightly diverted route takes in Goat Island (which isn't an island - see 'Insolated Strip' in the diagram with Walk 8). Thanks to Paddy Dillon for flagging this. The cover of the guidebook refers to 'notes on the Jurassic Coast Path' which were not included in the final published book/ePub/Kindle. 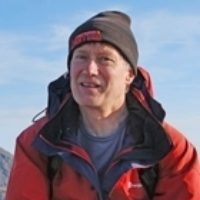 We apologise for any confusion or disappointment but readers can now download Ronald's introduction to, outline description of and tips on the logistics of tackling the Jurassic Coast Path here. I really enjoyed this unusual walking book. We hear so much about the Jurassic Coast but not everyone is aware of the extraordinary geology behind the area. Here the formation of this bit of coastline through Devon and Dorset is described in interesting detail including simple to follow diagrams and photographs and a guide to collecting fossils. This would make an excellent read in itself. For each of 30 walks there is a small coloured chart and an explanation showing the way the area of the walk fits into geological history and the Jurassic Coast. 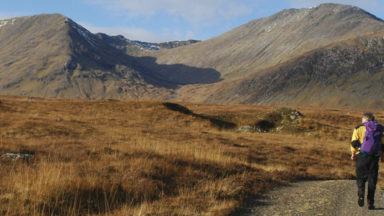 Not being able to find your way back to the route if you stray is a common problem when following a walk described in a book but fortunately here there are good Ordnance Survey maps included, far preferable to the sketch maps found in some walking books. There is the usual problem of book based walk descriptions that with the pictures and maps plus extra information about the area, each walk covers several pages, difficult to manage when you are actually out. I usually manage this by photocopying the relevant pages. Having said that, putting the extra information about parts of the walks in a margin is a good idea as it is accessible but does not interfere with the text you need to follow. Every one of the walks dotted along the coast looks attractive with its careful text, colourful pictures and map and I can't wait to get out and try them! Margaret, East Dorset Walking Group. The Jurassic Coast is one of only three natural World Heritage Sites in the UK. This is the perfect guide book for anyone wanting to explore the 160km of stunning coastline including its cliffs, beaches, rocks and fossils.